We head to the ancient capital of Nara, visiting several of the UNESCO World Heritage sites in the area. Hard to get to, but one of Nara’s most important temples. Due to it’s location this is a place that very few foreign visitors to Nara have the opportunity to see. Constructed in the Enryaku era (780 – 805), Murou-ji stands in a mountain valley, hidden in the midst of large cryptomeria groves. 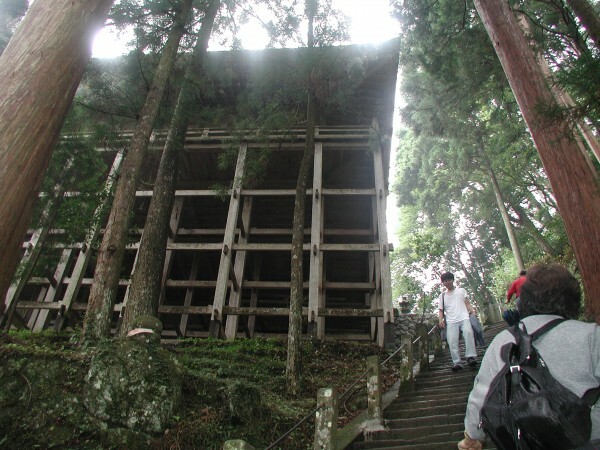 This temple has a strong connection with the Shingon sect (Esoteric Buddhism). At that time, a Buddhist monk named Kenkyo, practiced religious austerities here to pray for the recovery of the Crown Prince. It was his disciple Shuen, who made the plan of the temple. Ever since the late Nara period, the temple has been famous for welcoming women, and is therefore known as “Female Koya” as the other Shingon Temples (especially Mount Koya) were traditionally exclusively for men. Murou-ji possesses a fine collection of early Heian Period art works. The wooden sedentary statue of Buddha is considered to be the most outstanding among the number of Buddhist images kept at the temple. This statue of Shaka-Nyorai is an excellent representative of 9th Century sculpture. Related to Murou-ji since ancient times, Onodera was built during the Kamakura era at the request of emperor Gotoba. Even more difficult to get to than Murou-ji, this is one of Japan’s absolute gems – and just across the river from the temple itself, is an almost perfectly preserved Magaibutsu. 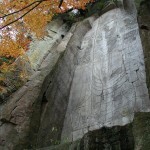 14 meters high, carved into a cliff face, this is one of the rarest in Japan. 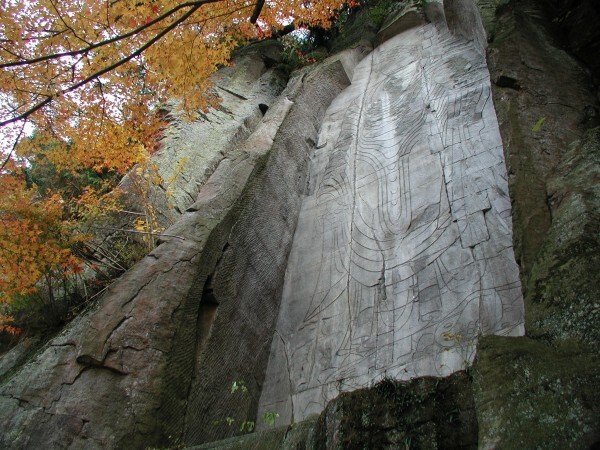 Rock carving flourished in the Han, and Northern and Southern dynasties in China, as well as in India, Afghanistan, and Korea. However in Japan magaibutsu never became mainstream in Buddhist sculpture, and from the 14th century, very few magaibutsu were made. If you can ignore the deer (feed them later), it is the perfect spot for obtaining a good view of the layout of Japan’s first “permanent” capital. Named for the young grass that thrives here after an annual fire festival, this mountain provides a bird’s eye view of the entire Yamato plain. From the top, you are only 30 kilometers as the crow flies from Osaka castle, which lies hidden behind Mount Ikoma directly to the west. On clear days you can see Kyoto to the north, and the great port of Sakai to the southwest. You can see the grounds of the Imperial Palace, which is slowly being restored. The view includes the railway that still cuts through the site, an appalling act of vandalism by the Kintetsu Railway company. Kofuku-ji and part of Todai-ji are also visible. Good place to be in you are into photography, so bring a tripod if you have one. Our next stop is historic Kofuku-ji, once the most important temple in Nara, currently being gradually rebuilt during an extensive rolling archaeological excavation. Kofuku-ji temple was one of Japan’s great temples in the eighth century. 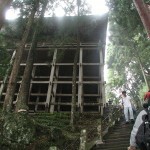 It was founded in 669 by a member of the Fujiwara clan to pray for the clan leader to recover from illness. It was originally built further north, but was moved to its present location when Nara became the capital in the year 710. For a while it prospered, but when the power of the Fujiwara began to fade in the twelfth century, the temple lost its influential patrons. The massive 5 storied pagoda is Japan’s 2nd highest – but it is not the original. It is a replica built in 1426. Kasuga Taisha Shrine is one of the most important Shinto shrines in Nara and is one of the “Three Great Shrines” of Japan. Although officially established in 768 by the Fujiwara clan, it is believed to date from the beginning of the Nara period (710). The shrine is located at the western foot of Mt. Mikasa (another name for Wakakusayama) and Mt. Kasuga, sacred mountains from which the Shinto kami (gods) first descended. The powerful Fujiwara clan (one of the most powerful aristocratic families of the period) and the Imperial court worshipped here, helping to make the shrine very prosperous. The Kasuga Taisha shrine is known for its thousands of lanterns and for the wisteria in the botanical gardens. This flower is important to the shrine because the name of the “Fujiwara” clan can be read as “field of wisteria”. You may notice that the shrine maidens even wear wisteria in their hair. The other feature of Kasuga Taisha Shrine are its 3000 lanterns, 2000 of which are stone and the other 1000 are bronze. Famous for an annual winter fire festival, this is one of the 12 temples that comprised a mandala (imagine a prayer wheel) for pilgrims approaching Todaiji. Most people head straight for the balcony, an architectural marvel, providing amazing views of central Nara, however it is worth taking the time to walk behind the main hall, where some of the best secrets of Nigatsudo are open to anyone with a bit of curiousity. Famous for the Daibutsu (giant Buddha), Todai-ji was founded by Emperor Shomu in 745 to protect against epidemics, and to consolidate the power of the Imperial throne. The temple took more than 15 years to build. The main hall is still the world’s largest wooden building, even though it was rebuilt in 1790 at only two-thirds of the original size. It is a little bit overrun with tourists, but worth seeing. The main entrance to the temple is inside the Nandaimon, or Great Southern Gate. The Nandaimon was rebuilt in the 13th Century and features two guardian kings (Nio), each more than 8 meters tall. Once you go through the gate, the sweeping horned roof of the Daibutsuden comes into view. The Daibutsuden (Great Buddha Hall), houses the largest bronze statue in Japan. The 15 meter tall, blackened figure sitting on a lotus throne depicts Rushana, later known as Dainichi Nyorai (the Cosmic Buddha). This statue is commonly know as the “Great Buddha of Nara” and is perhaps the city’s most famous attraction. The completion of the statue was an extraordinary achievement. After several attempts at casting the statue failed, it was finally dedicated in 752. The Emperor Shomu, his wife the Empress Komyo, and the reigning Empress Kogen all gathered to dedicate the statue by “opening his eyes”. An Indian priest stood on a specially built platform and painted in the eyes, using a gigantic brush. From the end of this brush were hung colored strings which ran down to the VIP’s below, enabling them to take part in the ceremony as well. Also in attendance were local monks, numbering in the hundreds, as well as ambassadors from China, India, and more distant places. The guests brought a dazzling assortment of gifts. Many of these have been preserved in the Shoso-in treasury, along with the original paint brush. Our last destination is Nara Koen. For a city park, Nara Koen is enormous. The park covers 525 hectares (1297 acres) of woodland and is the largest municipal park in Japan. It became a park in 1888 after 2 years of work, until that time the area had deteriorated until it was little more than a wasteland. Today the park is designated as one of Japan’s top scenic spots. Large numbers of “semi-wild” deer roam the parklands. These are not tame deer, but they are fed so often by so many tourists that wild isn’t an appropriate description.